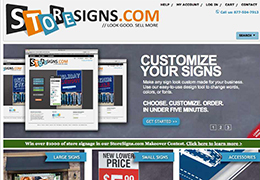 Nimbleware Apps has created a robust solution at the StoreSigns.com store site for selling professionally designed signage and related items for stores of any size. Templates for the signs are developed by StoreSign.com’s graphic designers using InDesign. Customers at the site use their web browser to customize the signs to their liking using a Rich Internet Application, developed in Adobe’s Flex programming language, which parses and modifies InDesign’s IDML directly from the template.